Have you ever wanted to listen to a few tracks in iTunes as you’re going to sleep, or had some other reason to stop playback after a certain amount of time or number of tracks? You could create a new playlist with the appropriate number of tracks and just let it play out, but that’s a hassle if you have to do it on a regular basis. And what if you want to shut your Mac down or put it to sleep afterwards to save energy? I suppose you could coordinate your playlist with Mac OS X’s Energy Saver preferences but, again—a hassle. I’ve recently been testing GuguSoft’s free iTunesShut 4.2 ( ), which offers a simple but effective solution: Enter the number of songs you want to play, choose an action to occur after those tracks finish—Shut Down, Restart, Sleep, Pause iTunes, or Quit iTunes—and then click Start. After the designated number of tracks finishes playing, iTunesShut performs the chosen action; iTunesShut updates the “Songs left” box during playback to let you know how many tracks remain before the action occurs. (Note that the current song doesn’t “count"; if you enter 5, the count starts with the next song. This also means that if you want the action to occur immediately after the current song, enter 0.) If you prefer to finish the current playlist, instead of choosing a number of songs, check the “Or wait for the playlist to finish” box. iTunesShut doesn’t affect iTunes’ playback settings; whatever playback mode you’ve chosen in iTunes will be used. So, for example, if you want to play the same track 10 times and then pause iTunes, just set iTunes to “track repeat” and set iTunesShut to 10 songs and Pause iTunes. Although iTunesShut’s functionality and interface are easily understandable, there are a couple improvements I’d like to see. First, I wish you could choose a sleep time instead of just a number of tracks; since tracks can vary wildly in length, I’d like to be able to tell iTunesShut to put my Mac to sleep after 30 minutes of playback. (There are other iTunes utilities out there that can do this, such as iTunEcho, but few offer as many options as iTunesShut in terms of what to do at the end of the playback period, and I’m not aware of any that can reduce volume automatically.) The developer could also make iTunesShut’s interface a bit clearer if the labels and text fields for “Songs left” and Volume were separated. 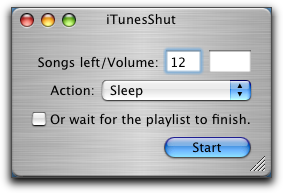 Still, of the various “iTunes sleep” utilities out there, iTunesShut is my current favorite.